“Sharpton thinks Obama should take more cues from his wife, Michelle. He still thinks about the time he bumped into her at a recent Chicago fund-raiser. He claims the conversation went like this. In less than three months, President Barack Obama will celebrate the anniversary of being sworn in for his second term as president. Although many conservatives are looking ahead with anticipation to the end of his final term in office, many liberals are looking ahead with the hope that in his final years as commander in chief, the president might begin pushing a more aggressively progressive agenda. Then there are those of us who are hoping that in the president’s final term, we might get to see the Michelle Obama we haven’t seen since the early days of the 2008 presidential campaign. Though she now enjoys an approval rating much higher than her husband’s (his is currently at an all-time low, while hers consistently hovers in the 60s), that was not the case on the campaign trail five years ago. Americans haven’t gotten a glimpse of that Michelle Obama in nearly five years. So here is a list of what some of us Michelle Obama fans would like to hear from her now that she no longer has to worry about her public image as a super-strong, super-fierce black woman who might cost her husband votes. One of the reasons President Obama was able to win election twice is the ease with which he downplayed the role of racism during his campaigns. During the 2008 election, he tended to dismiss the fact that he might lose votes because of his race, treating it as no more worth considering than losing votes for any number of superficial reasons, like his large ears he often jokes about. But we know better. We know that while not all of the criticism directed at the president is racially motivated, some of it is. We are not the only ones. His wife knows it, too. But so far she’s been too politically savvy to really go there out loud. But now that they are in their final term, it would be refreshing if she did. It was widely reported that former first lady Laura Bush played a role in convincing her husband to consider nominating a woman, attorney Harriet Miers, to the Supreme Court. Though Miers ended up withdrawing from consideration, the first lady’s private advocacy on her behalf was a reminder of the often quiet power that a first lady can wield. There have been two African-American male Supreme Court justices (Thurgood Marshall and now Clarence Thomas), and Sonia Sotomayor became the court’s first Latina justice. But so far there has not been a black female justice. It would be nice to see one (who is qualified, of course) before the first black president leaves office. (Here is a helpful list of possible black female nominees for the president and his team to reference in case they need ideas.) Here’s hoping the first lady uses her behind-the-scenes influence the same way the previous first lady tried to use hers. Well, guess what; Michelle Obama has more than a few reasons to be angry—from the National Rifle Association pulling her children into a political fight, to endless lies and racially charged language aimed at her and her family. 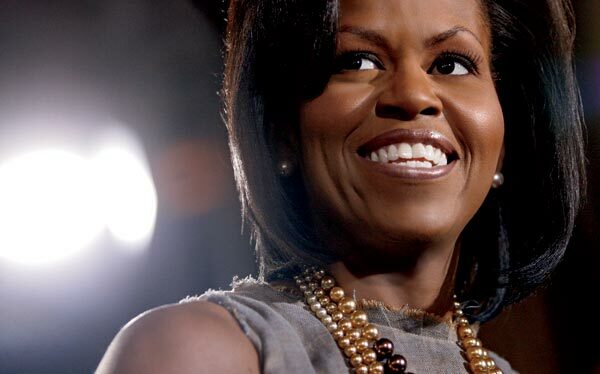 Is Michelle Obama a black female stereotype? Hardly. But does she have a right to occasionally get angry, as all of us do? Absolutely. Everybody from Ted Cruz to Sarah Palin to Bill Clinton. There are so many Barack Obama critics for whom we all know Michelle Obama has some choice words behind closed doors. Although she will likely save the really juicy stuff for her memoirs, it would be nice to see a teaser in her final year in the White House. If nothing else, could she at least tell us why she really rolled her eyes at John Boehner?